Summary of President James K Polk: "Napoleon of the Stump"
Summary: James K Polk (1784-1849), nicknamed the "Napoleon of the Stump", was the 11th American President and served in office from 1841-1849. The Presidency of James K Polk spanned the period in United States history that encompasses the events of the Westward Expansion era. President James K Polk represented the Democratic political party which influenced the domestic and foreign policies of his presidency as did the goal of westward expansion and the belief in the "Manifest Destiny" of the American people. The country expanded with the 1848 Treaty of Guadalupe Hidalgo when Mexico sold Alta California and New Mexico to the US for $15 million. The major accomplishments and the famous, main events that occurred during the time that James K Polk was president included the Indian Wars, the Mormon migration to Utah (1846), Bear Flag Revolt (1846), Wilmot Proviso of 1846, the Walker Tariff (1846) and the California gold rush (1848). James Knox Polk died of cholera on June 15, 1849, aged 53. The next president was Zachary Taylor. The summary and fact file of James K Polk provides bitesize facts about his life. The nickname of President James K Polk provides an insight into how the man was viewed by the American public during his presidency. The meaning of the unsual nickname "Napoleon of the Stump" refers to Polk's eagerness to exercise his considerable speech making skills. He took every opportunity to deliver a speech, and tree stumps were once utilized for this purpose, and his delivery was as fearsome as Napoleon when he spoke.. The character traits of President James K Polk can be described as intelligent, persuasive, determined, forceful and ambitious. It has been speculated that the Myers-Briggs personality type for James K Polk is an would be INTJ (introversion, intuition, thinking, judgment). A reserved, analytical and insightful character with a strong sense of independence. 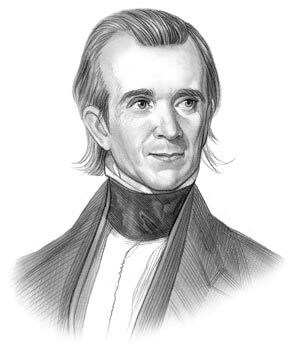 James K Polk Personality type: pragmatic, logical, individualist and creative. Summary of the Westward Expansion: The Westward Expansion encompassed the movement of Americans across the North American continent from the Atlantic in the east to the Pacific in the west. The movement west and the rapid settlement of territories was enabled by buying land, victories in wars, treaties and the displacement of Native American Indians. The process of Westward Expansion was made possible by progressive transportation systems such as roads, canals and the railroads and the belief in the Manifest Destiny of the United States of America. Summary of Manifest Destiny: The Manifest Destiny was the firm belief that occupation of North America was a divine right of the American people. Summary of the Mexican-American War: The Mexican-American War lasted just under 2 years from and was fought between April 25, 1846 – February 2, 1848 in Texas, New Mexico and California. Summary of the California Republic and the Bear Flag Revolt: The California Republic and the Bear Flag Revolt involved conflicts between American settlers against Mexico in Alta California. Summary of the Wilmot Proviso of 1846: The Wilmot Proviso of 1846 was an amendment to an appropriations bill to gain funding for the settlement of the Mexican-American War. The Wilmot Proviso stated that slavery should be banned in the territories acquired from Mexico, including California. Summary of the 1848 Treaty of Guadalupe Hidalgo: The 1848 Treaty of Guadalupe Hidalgo was signed during the presidency of James K Polk when Mexico was forced to sell Alta California and New Mexico to the US for $15 million. Summary of the California Gold Rush: The California Gold Rush (1848–1855) started started on January 24, 1848 at Sutter's Lumber Mill in Coloma, California during the presidency of James K Polk. The gold seekers, numbering over 90,000, were called the "49ers" as the majority of them reached the goldfields in 1849. Summary of the 1846 Oregon Treaty: The Oregon Treaty 1846 settled the land disputes between the US and Great Britain and ended the twenty-eight years of joint occupancy of the Pacific Northwest. Summary of the Elias Howe Sewing Machine: The invention of the Elias Howe Sewing Machine revolutionized the shoe and clothing industry providing the means for Americans to buy cheap, fashionable clothes. The article on the accomplishments of James K Polk provides an overview and summary of some of the most important events during his presidency. The following James K Polk video will give you additional important history, facts and dates about the foreign and domestic political events of his administration.